On the day of his assassination, Martin Luther King Jr. had a pillow-fight in his motel room. I love this. I’m so happy that he was able to experience such joy on his last day. As a twenty-something, my friends and I had enormous, knock-down, drag-out pillow fights in our apartment, usually with the lights off. Minor injuries, broken lamps and an occasional bout of romance often resulted. 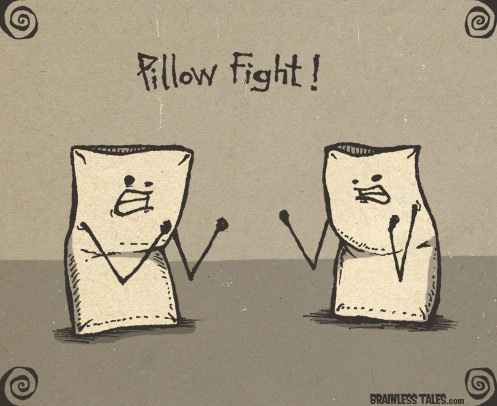 I started a relationship with a girl in the midst of one of these massive pillow fights. I nearly lost an eye on a zipper once. I haven’t had an honest-to-goodness pillow fight in twenty years. I didn’t even know that there was a National Pillow Fight Day until just now. Thankfully, I have a four year-old who will probably more than willing to correct this.